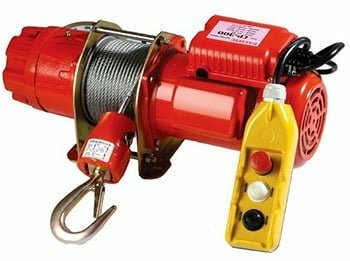 A winch is a lifting mechanism which works by winding up and winding down a rope or a chain attached to the material that should be lifted. The tension within the winch and the chain provides the lifting force needed to elevate the item. The electric winch makes the process effortless, requiring much less time and energy on your part. They are low maintenance, reliable and speedy in their operation. It can be difficult to decide on an electric or a hydraulic winch for your lifting needs, which is why All About Safety & Lifting is on hand to guide you through the process and help you settle on a product that’s right for you. Making the choice between a hydraulic winch and an electric lifting winch can be confusing, drawn-out and time consuming. That’s why we’re here to equip you with all of the information you need about the mechanics of the electric winch, and how it could benefit your business’ heavy lifting needs today. Drivetrain: we stock all types including planetary, worm and spur drivetrains. Motor: we stock both permanent magnetic and series wound motors to cater to all winching needs. At All About Lifting & Safety, we are Australia’s leading supplier of heavy lifting material and winching technologies (both hydraulic and electric). That’s why we not only have the expertise to advise you on how to use a winch safely, but also about how to choose the most efficient winch for your specific needs. This is why we start every relationship with customers with a consultation, listening to their product requirements and building our choices and recommendations from there. If you need lifting or safety equipment that isn’t listed, just get in touch with us and we will point you in the right direction. We have a combined 80 years of experience in the lifting and safety industries so know everything there is to know about lifting equipment. Give us a call today to starting talking to our experts about which winch and lifting equipment is right for you!